Go right on Collegeway. Left (south) on Ridgeway Drive. 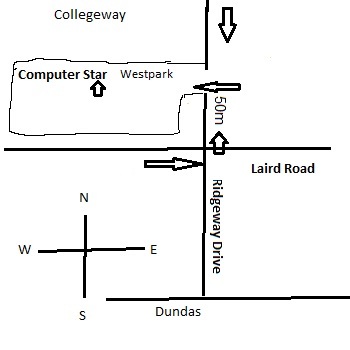 Turn right into last drive way before first signal (Laird Road). We are beside daycare. Pass 403 on Dundas. Go Left on Ridgeway Drive. Pass Laird Road. Go left (after 50 meter) into first drive way after Laird Road. We are beside daycare. Exit Dundas. Left on Dundas. Go Left on Ridgeway Drive. Pass Laird Road. Go left (after 50 meter) into first drive way after Laird Road. We are beside daycare. Exit on Winston Churchill blvd. Right on Winston Churchill. Left on Dundas road. Right on Ridgeway Drive (North). Pass Laird road. Left into first driveway (50 meter) after Laird road. We are beside daycare. Quick / same day solutions. Free estimates (In-Lab only) & free pickup. 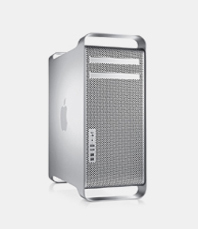 In most cases we can evaluate your hard drive while you wait. Free hard drive or media pickup if you live in the following cities of Greater Toronto Area. Free in-Lab evaluation and free computer repair (combined with data recovery) for Mississauga, Brampton, Milton and Oakville. 5% (data recovery) discount for residents of Toronto, Hamilton, Richmond Hill, Markham, Vaughan, Pickering, Guelph, George Town, Burlington and surrounding cities. If you live outside GTA, You can ship your media using any courier of your choice.